Well there are very few companies which provide ear drops franchise in India, Trumac Healthcare is one among them. Under its division of Camrut Pharma, it provides the ear drops franchise with 2 products currently. Total ENT (Ear Nose Throat) range is 30+ products. 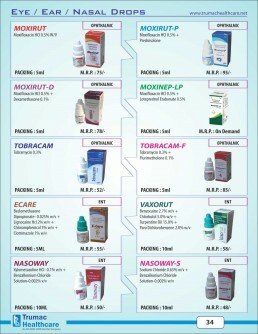 Trumac Healthcare is leading PCD pharmaceutical company in India. We are manufacturers and suppliers of finished pharmaceutical medicines since last 10 years all over India. We have a wide range of product portfolio consisting of tablets, capsules, injectable, syrups, ointments, eye, ear and nasal drops & Ayurvedic Medicines. Our products are manufactured at one of the best state of art manufacturing facilities, which are WHO and GMP certified units. With more than 400 franchises given all over India, we are successfully catering to the demands of our clients by providing them with general range as well as special divisions range like Gynaecology, Dermatology, Orthopaedic, Paediatric, Ophthalmic, Cardiac-Diabetic & Ayurvedic Care. Since our inception in 2007 we have been serving hundreds of clients all over India in each and every state. This growth has only been possible due to our strict control over quality of our products and our sincere efforts to follow all guidelines and procedures. We try our best to keep up to this momentum in order to serve our society for a better healthcare system. We are constantly trying to make the products more affordable by setting up our own manufacturing units as soon as possible. We are also planning to open our dispatch centers in Central & East India in order to make products more accessible to our clients. To ensure the availability of products in each and every part of India, we are constantly appointing new clients in order to cover as much ground as possible. Launched Derma Division by the name of “Arcas Biolabs” which consists of 50+ Dermatology products and expanding at a fast pace. By the end of 2017, product range of this division will cross 100 products. 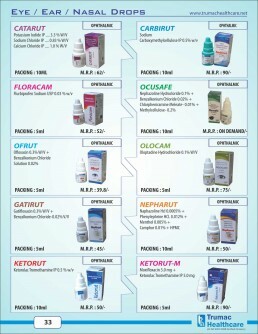 Launched Cardiac-Diabetic Division by the name of “Ecron Lifesciences” which consists of 30+ products. By the end of 2017 product range of ecron will cross 70+ products. Addition of more than 40 products in first three months of 2017 mainly in orthopaedic, gynaecology & Ayurvedic Range. Plan to add another 70-80 new products this year in our portfolio.